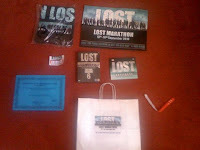 The LOST Marathon is completed, finishing at around 6am UK time the bleary eyed participants have emerged four days later back into society. 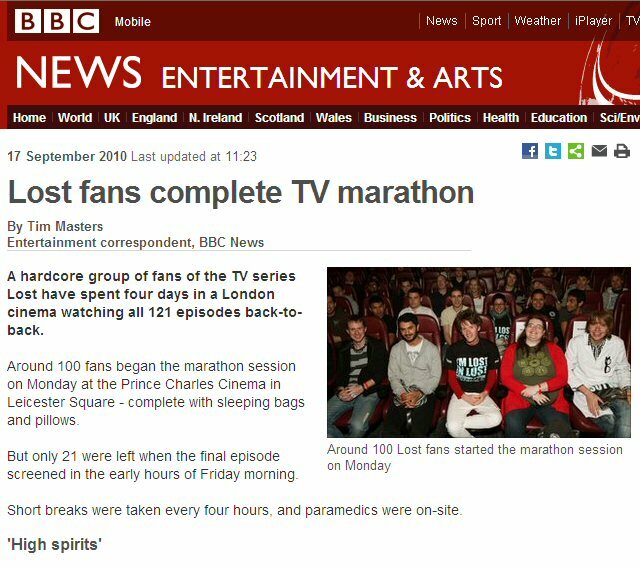 The image on the left is from the BBC News Website and was published this morning after the marathon finished. When the remaining die hard LOST fans left they were given a certificate of disorientation and a bag containing lots of LOST goodies. LOST MARATHON from Mr.Londoner on Vimeo. If you find any more press coverage of the event over the next few days we would love to hear from you. I wish they had something like this out here. I would have loved to gone. Watching with other losties would be a blast ! Congratulations to all those 21 hardy souls! I don't think I can physically do it! I suppose we'll hear/read more details as participants "wake up" and "flash back" to reality! Congrats to all who tried and to those that made it all the way to the end. We had some good fun following along on Twitter. But special shoutout to LOST_4815152342 (cuinanotherlifebro, cuinXlifebro, Paul) who made the epic journey from Scotland, cosplayed "Charlie Pace" Season 1, provided endless twitter updates, vid, photos, only had 14 hours of sleep total, got a tweet from @DamonLindelof @NoreenOT @mjgoldman, @heykristoper, and @JOvsZ . He is also, as far as we know, the only LOST fan to watch "The End" in theater on two different continents. Proud to call him friend and fellow LOSTarger! Just added a video to the main page, very nicely edited together. @ Just Thinking, I had to say this here since I don't remember where your email is. ... Your the greatest ! She sent me some cd's of Bill Cosby to listen to for some laughs while I go through this illness of a brain tumor. I have to say that we were just talking here at home last week about watching something funny every week to relieve the stress. Thanks so much, you really made my day ! And, I love Bill Cosby ! Very welcome Lisa. I wish I had an island you could go to to just make it all go away. Maybe I should go see the palm reader ? lol A island sounds nice too, just no smoke monsters. :-) I am enjoying them very much ! Hello from Tokyo. I would like to say congratulations for everyone at the PPC LOndon. I was so impressed by this event. I feel how much they love LOST. I think that theater did great job. Fortunately I could remotely sync to rewatch for 6.15 to 6.17 orchestrated by Lotto. Really impressed. Thnaks for all. Happy Lost Anniversary! Miss ya'll! Liner notes for the season 6 soundtrack have a Jack Bender "scales" painting on the back. Interesting- it looks like a painted over photo- not the ones in Widmore's office. It's sad to see no traffic on this site now. I still can't move on. Hi all, there is a little more for you in a NEW POST. Yes it is sad to see that there isn't much discussion here now, but we will all meet again somewhere.